Who could expect to see much from a January bloom day display? At the urging and motivation of Carol at May Dreams Garden, the show must go on. This is my third month to participate even though bloom day was started a year ago. These are the months when gardening in Florida is most enjoyable. The sun is shining and the skies are blue and for the most part we are humidity free... very unlike our long, hot summers when I will be enjoying the blooms in the northern gardens more than my own. What a surprise. When most of the flora in this area is lacking any enthusiasm due to our flash freezing temps a couple of weeks ago the impatiens in my garden have emerged center stage. By all accounts they are the weakest in nature not liking direct heat or too much wind and would surely have shriveled at the onset of such cold weather. Being keenly aware of their sensitivity to the threat of freeze and their location susceptible to the north wind, I took special care to cover these in my front bed well (I'm so thankful I did even though I grumbled my way through it). It was to be that they appreciated the snuggly blankets as they hunkered down between the Xanadu and the Liriope for the long night. Today they are mocking that cold spell as they enjoy our current mild weather. Arranging this group of impatiens, petunias and polka dot plant is by design placed in perfect view from my kitchen window. A visible cheery garden sight at first glance while I'm indoors is a must! Do you do that too? ... Making certain your line of sight out of popular indoor spots gives you color? The New Guinea Impatiens with their bright red blooms and deep toned foliage joins the cheery team that catches my eye looking out through the kitchen window. 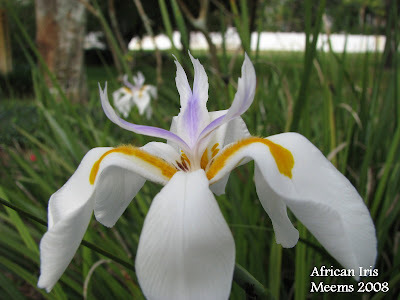 African Iris is an intriguing plant. 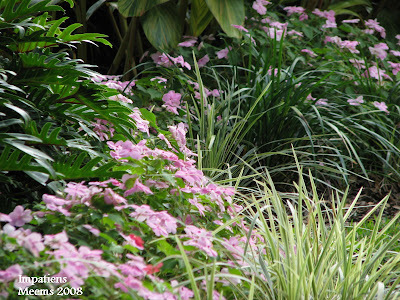 It does well in full sun to part shade and multiplies itself over time. I have dug up several plants from this "mother" Iris and transplanted them successfully throughout my garden. In the spring the entire bush will bloom profusely from almost every stalk after each soaking rain. In the summer not so much... but as soon as it feels the cool nights again it will make random efforts like these to produce a few here and there. The blooms only last a day or two. I love white bloomers and this is one of my faves. 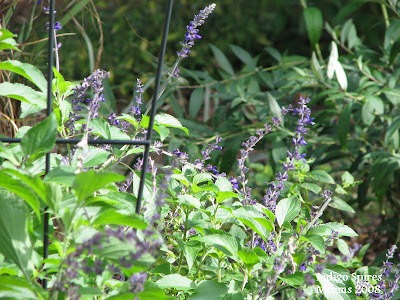 Indigo Spires (Salvia) is another of my favorite perennials. I adore the way the long, lanky blue-violet spikes (these can grow up to 1 ft) wave in the wind. It performs well in heat and humidity (we have more than our share of that) and it is guaranteed to be a butterfly and bee magnet. Weeping lantana is perfect to use for colorful low maintenance groundcover... it is fast growing and easy to propagate, establish and maintain. The flowers are very attractive to butterflies and it is tolerant of hot and droughty conditions. 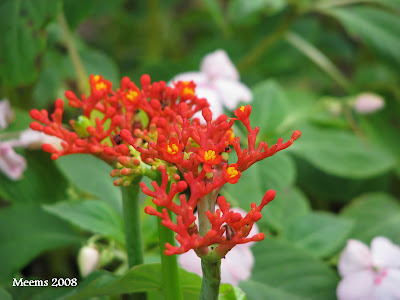 I am using it here at the base of Jatropha, Tipachena (sp? 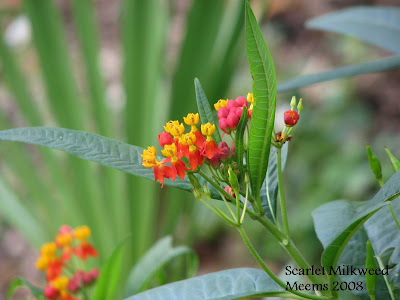 ), and counting on it to spread to underneathe the Scarlet Milkweed. Speaking of Scarlet Milkweed. I am so tickled at how well the Milkweed is doing its intended job of hosting Monarch caterpillars. I didn't cover these during the freeze and they made out just fine. 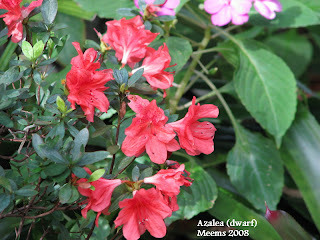 The Dwarf Azaleas in my front beds are producing loads of blooms and the Formosa's have buds all over them. It won't be long and most of the homes on our street will display every color and size of Azaleas. Plumbago has been a consistent producer although as you can tell they are now looking a bit scraggly. In a few weeks I will trim them back with a severe pruning and the show will start all over again for all the hot, sunny months in my garden. 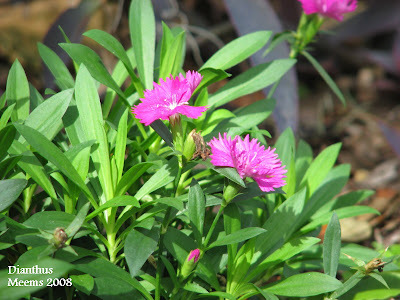 There are only a couple of Dianthus plants left from when I planted a few in the fall. I like the bright color and I might try planting a few more of these in the spring. I'm not completely sold. 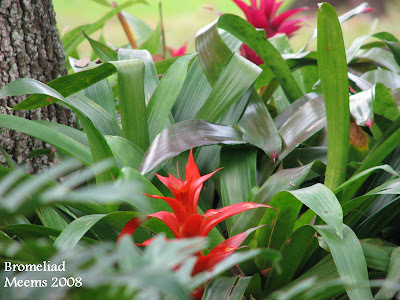 There are several Bromeliads producing blooms right now. These plants are so easy as they require so little attention. Most of them have such unique foliage offering its own display of beauty that even when they aren't blooming there's nothing to disappoint. 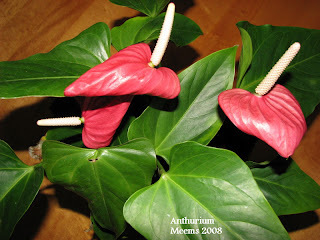 Okay, this is an indoor Anthurium. This is the first time I've photographed an indoor bloom for my blog! I would have felt like it was cheating except the blooms here have come up since I bought the plant in the first of November. Indoor plants are not my 'thing' but I buy them anyway and when they decide they've had enough I transplant them in the ground somewhere in my yard and we all stay happy. As a regular feature on hoe and shovel I post what's blooming this month in my garden so you are welcome to look through those as well. 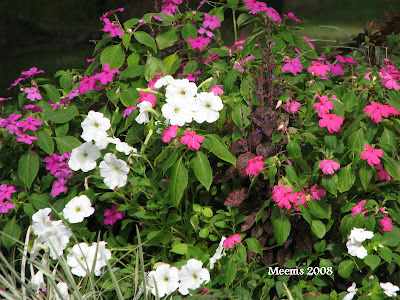 Some are the same flowers, some not taken in the same location. Thanks for walking through my January bloom day with me and thanks to Carol for inventing the fun! I welcome your comments, it's nice to know you were here. You have so many blooms! I agree with the view out the kitchen window, or all windows really, needs to be beyond pleasant. Yours must be very cheering indeed with all that color. I am impressed with your milkweed flowers. Only the solid orange blooming ones have been successfully grown here in TN. I'm so glad you posted today, Meems! Consider it a public service to all of us color-starved northern gardeners. I'm so glad that the freezes didn't destroy everything. Beautiful blooms! I'll be back when I have more time, to check out your site. Great name! I enjoyed this walk through your garden. I was thinking, yes, I remember flowers, bright pretty things, aren't they? Oh, and I once heard that Barbra Streisand made sure that the flowers viewed from each room in her mansion were perfectly matched to the decor of that room. Must have driven her gardener nuts. Thanks for joining us for bloom day again. I am surprise that your Plumbago has flowers. My are long gone and the plants were pruned. I like that African Iris. I never had much luck with Iris here in Miami. Overall it looks like your garden came out OK from the freezing temperatures. 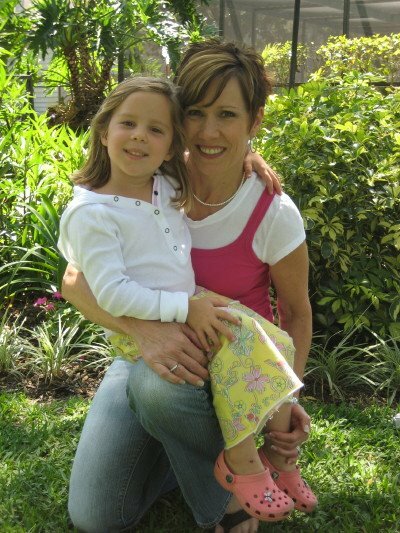 Meems, Thank you for the BLOG training, I can only hope that my BLOG BLOOMS as beautifully as yours!! frances: thanks so much for stopping by and taking the tour. Nan: Our freezes generally only last a couple of hours and other than some brown tips we survived fairly well. Carol: funny BS story... that would be a task for certain. Thanks for facilitating GBBD. P- Anytime... you will do just fine once you get started. 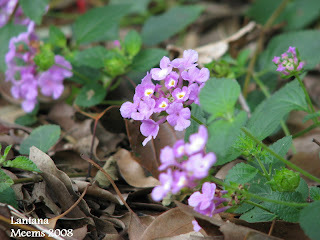 Thank you for making a blooming day visit to my blog - we seem to have a lot of plants in common,[salvias, milkweed, etc.] but yours are blooming and most of mine were frozen. I love that white iris - you've taken some great photos. Happy Blooming Day! It's great to see that soem gardeners have a lot of blooms to show for GBBD. Your garden looks lovely Meems! I love your african Iris especially! Beautifull blooms! It looks like a tropical garden. Why is the lantana weeping? You have so much blooming that stopped with the freezes in Austin a month or so ago: plumbago, Indigo Spires salvia, impatiens. It all looks lovely. Like you, I've been enjoying the weather, and digging like crazy lately. We have to get it done before the heat, humidity, and bugs of summer arrive, don't we? You African Iris is so perfect, it looks fake. (That's a compliment.) I love seeing the Plumbago when I make my annual pilgrimage to Florida. It is such a dreamy shade of blue. Here in Chicagoland, I should try to grow some in a pot to take inside in the Winter. Oh, Meems...these are just so glorious, I can hardly stand it. What a great way to chase back the blahs of a grey Nova Scotia day. I especially love the plumbago; I have one in a pot but it won't present me with flowers before next summer, when it can go outdoors again. SO I'll just enjoy yours, and all the rest of your splendid plants. ! Hi Annie: thanks a bunch for visiting on bloom day! Yolanda: it was so nice of you to come by for GBBD. I hope you'll come back again. Your blooms were a delight to see too. So many lovely orchids. I'm glad you like my African Iris... it's one of my favorites. Gintoino: Glad you stopped by. I guess you could say we are mostly tropical here. Right now with mild weather that's a good thing. In the summer time I whine about the heat a lot! mlm: I can't answer that question. The other varieties of lantana are not called weeping lantana so I don't know. Maybe another reader can help??? Anyone? Pam: Yes, I agree this is a great time to be outside. There is so much to do right now because the awful humidity and heat will upon us before we know it. I'm so glad you dropped by and thanks for your post on GBBD also. That bottlebrush photo on your post was simply magical! 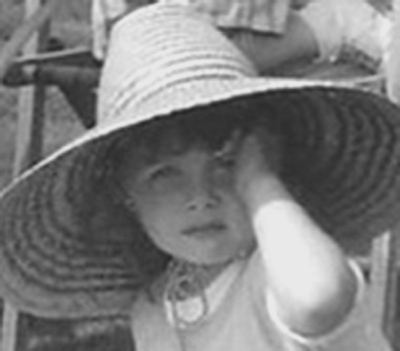 Welcome Mr. M's Daughter to my blog --I am so happy you came by. 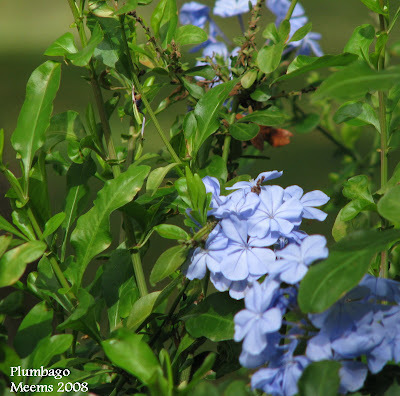 It's funny --the plumbago was a popular bush when I was child - I could remember my parents had several and the little flowers would stick to our clothing when we brushed up against them. I didn't want them in my garden for the longest time but now after having them for a few years I have to say they bring me much delight-- the deep blue is so unusual and they hardly take a break from blooming. The tiny little Cassius Blues love them too! Jodi, Hi and happy GBBD to you! I just know in a quick few months you are going to be so happy with all the color back in your garden. Don't worry I will be gah-gah over all the flowers your garden will sport in the midst of summer when we are wilting from heat. I just love the way you can save things in pots to put them back outside AND you can count on them to bring you joy again. I'll be sure to come by and see you in a bit also! It's great that us Northern snowbound gardeners can come to warm-weather blogs and admire the blooms. Seeing Salvia at this time of year warms the heart. I am amazed that your Impatiens survived the cold snap. Wow - the African Iris is gorgeous. I just love it. Your garden looks wonderfully lush and blooming. Your exotic flower is a type of jatrophra-perhaps the "Buddha belly plant". It was popular here when I was a child, have been trying to get a plant for a while. I am particularly partial to New Guinea impatients and am so pleased to see it here. Funny though--I don't have one in my garden right now. Must remedy that. 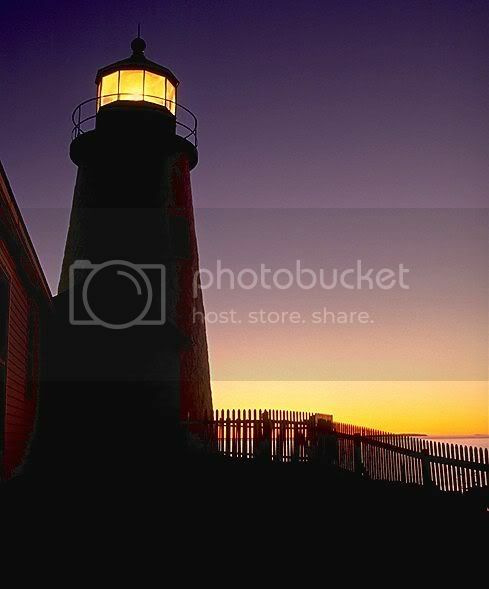 Thanks for posting a lovely shot of it. And the plumbago--I love that shade of blue! 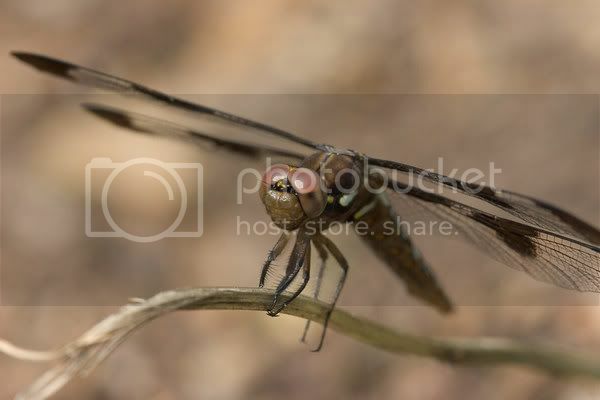 Hi all- sorry to just now respond- Hubby and I have been out of town for a long weekend (without computer) and just now returning. Kate: Always nice to have you stop by. It won't be long and you will be growing your own beauties in your beautiful spring season. I look forward to it with you. Nicole: Thanks for visiting and double thanks for the ID. Finally... you can't imagine how long I've been attempting to know the name of the Buddha-Belly. Never would have guessed it to be in the Jatropha family. I wish you were closer I'd be so happy to share a plant with you. They re-seed themselves so rapidly as well. Thanks again! Willow: Don't you just love the way the foliage is deeply hued which makes the flowers stand out so nicely? 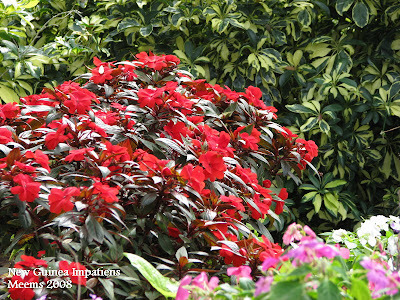 Will your impatiens grow all year round where you are? Shirl: Welcome to Hoe and Shovel and a special thanks for admiring my blooms.